It’s just not possible for me to go to Chicago without getting an Italian Beef. Let me back up for a second and tell you why I was in Chicago. You see, my brother and sister-in-law are having a baby! They’re set up to make Thursday morning the latest possible day the doctor would let the pregnancy go, so I hoped on an Amtrak and headed home. The Amtrak doesn’t quite make it home though. In fact, I’m still an hour and a half short. So, once I got to Union Station (an hour late. Thanks, Amtrak!) I had a thirteen block to Millennium Station to catch a METRA train to get a little bit closer to home. From there, my dad would have to pick me up and drive me the rest of the way. So, like I mentioned, Amtrak screwed up my plans and I missed the 12:30 Metra out of town. I had to wait for the 1:30 and I was starving. Now, there are a ton of places to eat in the theater district where Millenium Station is. In fact, J and I had a great date one night just down the road at a place called Petterino’s (review HERE) before seeing Wicked at the Ford Theater. I didn’t have time for anything like that. I needed a sandwich shop. I walked a few blocks from the train station then turned around to head back and eat at one of the 6,546 Subways in the three block area. 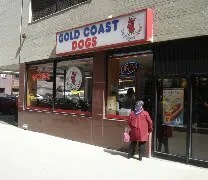 As I was crossing the street, I noticed a sign for a hot dog shop a block off of Randolph on Wabash Ave.